On 31st August 1941, he left New Providence for England via Miami, New York and Halifax, Nova Scotia from where he sailed to England in a convoy of ships arriving at Liverpool on September 19th 1941. He spent several days in London and then went to Readcar to be outfitted and spent thirteen months in training and studying. He passed out as a mechanic and later remustered to fitters course and then to aircrew as a Flight Engineer Air Gunner. He first served with the 115 Squadron of Bomber Command and later with Group 8 of 156 Squadron of the elite Path Finder Force, Bomber Command stationed at Warboys Airfield in South West England. After completing thirty-six operational flights in April 1944 he was recommended and received the prestigious award of the Distinguished Flying Medal (D.F.M.). 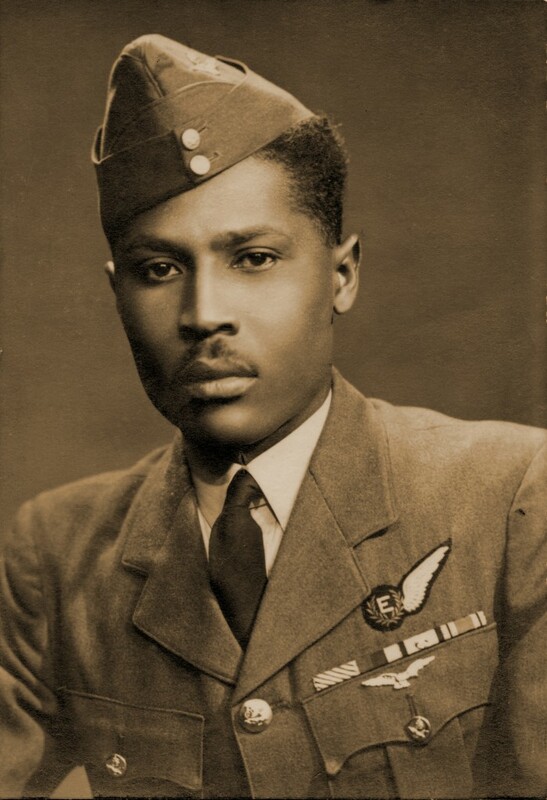 “He is a member of an outstanding Path Finder Force crew, and his resourcefulness and unfailing efficiency have contributed to the aircraft returning to base from raids during which the safety of the aircraft depended upon his knowledge and skill. He is cool and unruffled under fire and his consistent skill and reliability under harassing circumstances have been inspiring to other members of the crew.